Large medium-speed catamarans are currently under development as a new class of vessel for economically efficient and more environmentally friendly fast sea transportation. Their design is based on current highspeed catamarans to adopt their advantages such as large deck areas and low wave-making resistance, but they will operate at lower speeds and carry a higher deadweight to obtain higher transport efficiency. Transport efficiency is defined as deadweight carried per required engine power at a certain speed and a high value represents low fuel consumption per deadweight tonnes per distance travelled. Large medium-speed catamarans will operate at speeds around the main drag hump, where the highest wave-making drag occurs and hence this speed range is usually avoided by boat designers. Therefore, these vessels require guidelines for their hull form design to efficiently operate in this generally unfavourable speed spectrum. Computational fluid dynamics (CFD) tools were investigated to assess their capability for predicting the vessel drag at model and full scale in deep and in shallow water. A potential benefit is avoiding empirical extrapolation methods, which are required when using towing tank tests to obtain the drag for the full-scale vessel. For an initial design space investigation, hull form parameters providing low drag for catamaran and monohull vessels were sourced from literature. Based on these findings, a hull form family was developed with vessel lengths ranging from 110 m to 190 m for carrying a similar amount of payload and the hydrodynamic performance was evaluated at Froude numbers from 0.25 up to 0.49. To provide more accuracy to the final drag prediction, whilst minimising analysis resource requirements, a novel full-scale CFD-based approach was developed. The key advantage of this method is that the same computational mesh can be used for model-scale verification and fullscale prediction, where the desired Reynolds number is achieved by altering the fluid viscosity. It was verified using results of model scale experiments of a 98 m and a 130 m catamaran and validated with results obtained from sea trial measurements of the 98 m catamaran, in deep as well as in shallow water. The computational full-scale simulation approach was found to be capable of predicting the drag force within 5% of results derived from full-scale measurements and extrapolated model test data. In addition it has been shown to correctly predicting steady and unsteady shallow water effects, which made this tool suitable for resistance extrapolation if either the model or full-scale ship sails in deep, shallow or even transversally restricted water. Furthermore, the local flow phenomenon of transom stern ventilation was studied numerically and experimentally. The feature of the flow in the stagnant zone past the partially ventilated transom was identified as a non-shedding squashed horseshoe vortex and the numerical simulation was capable of accurately predicting the state of ventilation. Finally, it was found that the lowest drag can be achieved for catamarans with demihull slenderness ratios (L/∇1/3) of 11-13. Hulls of 150 m in length provide highest transport efficiency for speeds of 20-35 knots at a draft of 3.1 m, and 170 m and 190 m for 3.6 m and 4.1 m vessel draft respectively. At the lower speeds of this range, a shorter hull may provide comparable transport efficiency. 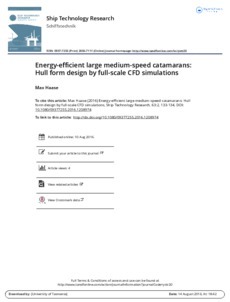 Finally, when comparing the results to contemporary large and fast catamarans carrying equivalent deadweight and travelling at the same speed, fuel saving up to 40% can be achieved if a hull of 150 m instead of 110 m length is used. This demonstrates that large medium-speed catamaran have the potential to be a fuel-efficient alternative for a successful future of fast sea transportation.